Robertson, who had lost in the last eight to Allen in last years event served notice immediately that he was in good form by taking the opening frame with a 74. Allen though was far from rattled at the quickstarting Australian and promptly hit back with an 88 to level. It was high quality snooker from Robertson and Allen and it was Mark who was to move in front with the help of a 124 break, which was also the 134th century of the Antrim man's professional career. Allen should also have taken the fourth frame. He once again had the first opportunity and made 43, but a few errors started to creep into his game - and the crucial one was leaving a green sitting over the corner pocket. With nothing short of precision and patience it was Robertson who left the arena at the mid session interval at 2-2 after a 77. Returning Allen looked far from finished as with the help of a 47 he won a 21minute fifth frame. The pendulum of momentum was swinging backwards and forwards - and it seemed to be tilting towards Allen as he held a slender one point advantage with two reds left on the table in sixth frame. 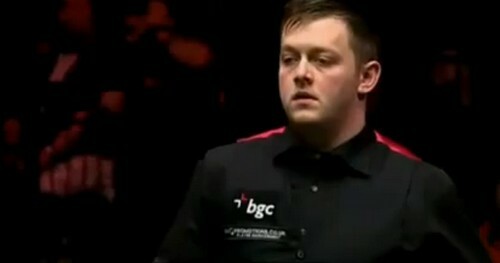 But a miss on a risky long red it proved to be the pivotal frame as Robertson pieced together a 42 to level at 3-3. From that moment on the Australian looked revitalised, a 100 break saw him lead 4-3, and then the clearance that may well have finished Allen off mentally. After firing in a 53 he then missed a red to the centre. Robertson , was waiting to pounce and knocked in a 71 to extend his lead to 5-3. Minutes later it was all over as Neil completed a 6-3 victory with the help of an 80 break to set up a quarter final clash with Mark Williams.